This article is 1976 days old. Rising chess star Ellen Tao will be representing Canada for girls under 12 at the World Youth Chess Championships (WYCC) in Al Ain, United Arab Emirates that take place from December 17th to 29th. Ellen Tao is a Grade 6 student from St. Gabriel Catholic Elementary School. This is her first time representing Canada in the World Youth Chess Championships. Ellen started to play chess since Kindergarten and is a very active and competitive player throughout these years. In August 2013, Ellen won the 1st place in the Canadian Amateur Open Chess Championships in Kitchener Ontario. 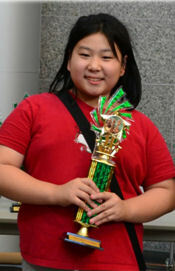 In October 2013, Ellen won the 2nd place in Michigan Chess Festival under rating 1400 section. The World Youth Chess Championship takes place once a year in a different country. The top players in each age division from all the participating countries get together to compete for the WYCC titles. This year the event is hosted by the United Arab Emirates (UAE) Chess Federation at the UAE University in Al Ain which is 120 km from Dubai. Currently there are 1640 players from 95 countries had registered to compete in this event. Please visit the related websites attached to this letter for more information.